Amazon India offering Surf Excel Matic Top Load Detergent Powder - 2 kg Rs Rs 329 at Cheapest and best price . make cart value 499 Else charge Rs 40 Shipping charges Or Free and Fast Shipping for Prime Users. Activate your prime account .You can follow the below steps to buy this product at their deal price. Keep Visiting dealsheaven.in for more Best offers ,hot online deals, promo code, coupons and discount . 15% coupon available for Subscribe & Save delivery. Save up to 10% when you subscribe to recurring deliveries. Cash on Delivery only. Choose from thousands of products. We'll automatically place your orders and deliver them to you by your monthly Subscribe & Save delivery day. Create your subscriptions. Cancel anytime. No commitments, obligations, fees and shipping is free. Created to work in high water level of top load washing machines. Dissolves completely leaving no residue on your clothes or in your machines. 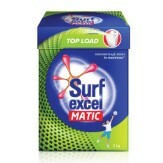 How to get Surf Excel Matic Top Load Detergent Powder - 2 kg ?